Space Invaders Bank | OhGizmo! It doesn’t look like it will hold a lot of your savings, and it definitely won’t appeal to kids who’ve grown up with Xbox’s and Playstations, but those of us old enough to remember Space Invaders should find this ‘piggy bank’ from Takara Tomy pretty awesome. 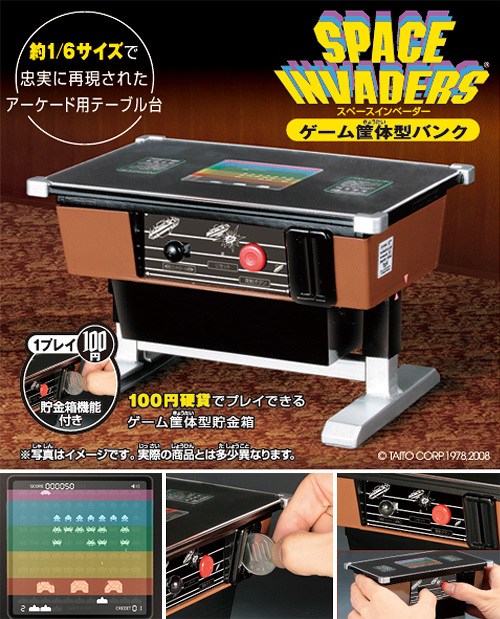 Not only does it look like a perfect 1/6th replica of a tabletop arcade system, but it’s playable too, with authentic sound effects and controls. And the best part is that it will only set you back about $60 when it becomes available in March… as long as you live in Japan. Alongwith saving money now you can enjoy music also, nice gadget! I like it and i would like to have it!